Over the past few months, I’ve been using a new translation of the Bible called the Christian Standard Bible. 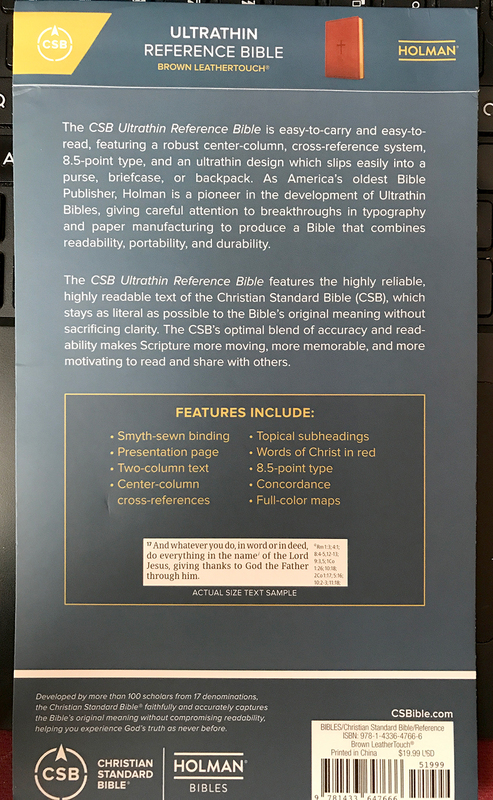 Published by Holman Bible Publishers in early 2017, the Christian Standard Bible (CSB) is an unexpected, yet (apparently) necessary, update of the 2004 Holman Christian Standard Bible. When a well-established publishing company produces a thorough revision of its previous translation—with the intent that the new version completely replace the old—less than 15 years after the original, one sits up and takes notice. In fact, when I announced that I would be reviewing this Bible, the very first question my friend and former seminary classmate, Gale P., had was: “Why? What’s the agenda? Was it necessary?” It is my intention that this review address those questions. When I requested a review copy from B&H Publishers in March, I determined to use it regularly for a while before forming an opinion—I have no desire to write a review without doing my due diligence. So, that said, I feel like I’m finally at a place where I can share my opinion based on use in worship services, Sunday School, and personal study. But before I share my impression, I’d like to tell you about the translation itself and the physical copy I received. To introduce you to the CSB, I’m going to quote directly from the full-color, cardstock sleeve in which my Bible arrived. Why use their words and not my own? So, back to Gale’s question: Why did Holman find it necessary to completely revise their HCSB translation of the Bible? It’s actually pretty interesting, especially in light of the fact that they brought together “more than 100 top conservative scholars from 17 denominations” to work on the 2004 translation. I guess the final translation wasn’t as marketable or acceptable as they had anticipated. 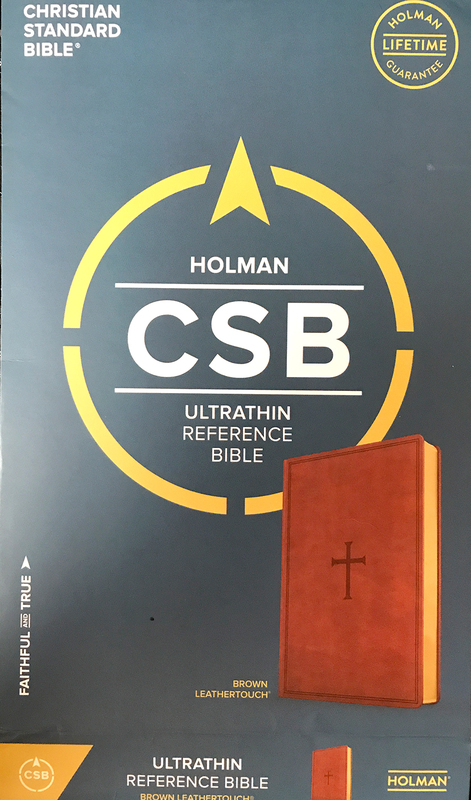 It appears that the main catalyst for this 2017 revision (and new name: CSB) was the feedback they received about the HCSB “from pastors, seminaries, and other conservative denominations.” Oh, to be a fly on the wall at Holman! I have no idea what type of comments were made. All I know is that they refer to the new CSB as “a translation that’s even stronger” than the HCSB! And there you have it. It’s stronger!💪 (Are they saying the HCSB was a weak translation? And what are the implications of using the HCSB as the backbone of the CSB? My brain hurts.) If you’d like to know more about why they revised the HSCB and what the major differences are between it and the CSB, you can click here. One of the questions I had was who exactly worked on the “stronger” version? Although the HCSB boasted “over 100 top scholars,” the revision team was comprised of only 21 scholars. With the help of Google, I was able to determine that the educational backgrounds of the CSB scholars fall into the following denominations: Baptist (10), Evangelical (4), Lutheran (2), Presbyterian (2), Anglican (1), Non-denominational (2). You can click here to view the list of scholars for yourself. To use inclusive language, or not to use inclusive language? When I was a child, the third person masculine pronoun “he” often meant “he or she.” By the time I was in college (in the 80s), language had become more inclusive and more bulky. Instead of using “he” as the inclusive pronoun, we began using “he or she” OR “she or he” OR (my favorite) “s/he.” By the time I was in seminary, textbooks were being published with pictures of females in stereotypically masculine roles (e.g., architect, doctor, hunter) and males executing stereotypically female duties such as holding a baby or cooking a meal. Fast forward to the twenty-first century, and our children are growing up in a world where “he” is “one male,” and “she” is “one female,” and you’re going to have a tough time with Bible translation. Publishers have been trying for years to bring gender inclusivity to ancient Scripture, but it’s not as easy as swapping pronouns. In the vast majority of foreign languages, both ancient and modern, the masculine plural has always included women; however, it hasn’t always been translated like that. So, when scholars came together with the intent to make their translation more accurate and able to be understood by the modern reader, it makes sense that they decided to use inclusive language wherever and whenever appropriate. You can read about their translation decisions (and employment of inclusive language) here and here. 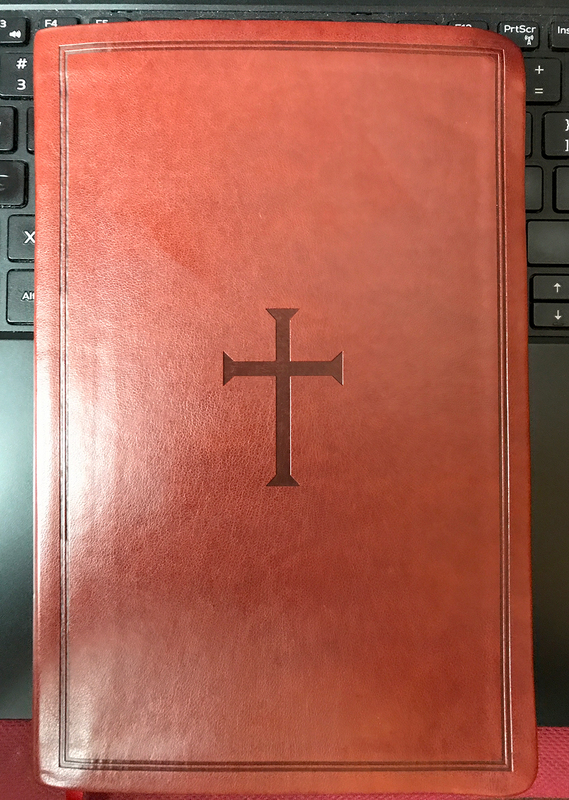 The CSB Thinline Reference Bible I received to review is bound in a medium-brown faux leather with a debossed cross on the front cover. The pages are gold-gilded (probably not real gold), and the Smyth-sewn binding helps the the Bible to lay open flat without having to put a weight on the pages (although you might have to break it in a bit after you first purchase it). It’s the perfect size (not too big, not too small). The 8.5 point sans serif font is surprisingly easy to read considering how small it is. The translation features topical subheadings, cross references, a concordance, and maps. I love it! 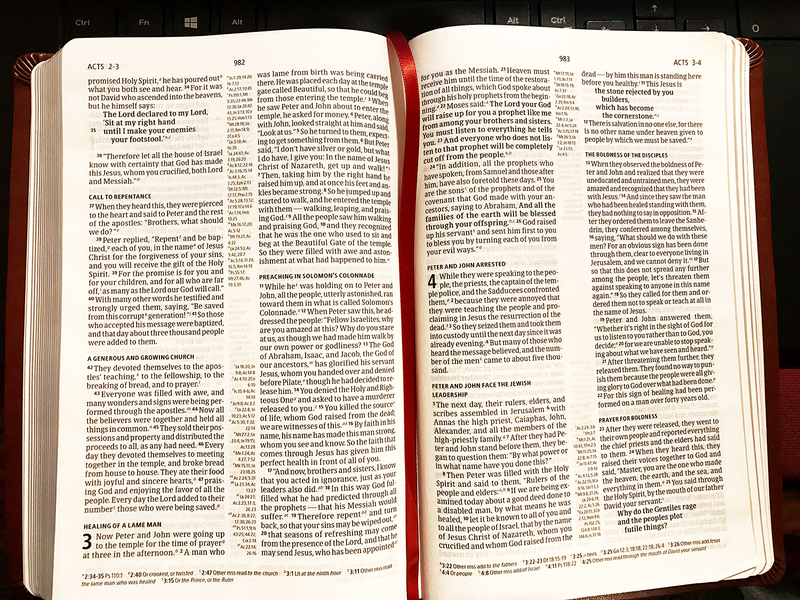 When it all comes down, though I find the Christian Standard Bible to be an excellent resource, I don’t think I would rely solely on this particular version when teaching a class. (Teachers should always use more than one translation when preparing—and, if possible, teaching—their lessons). Great review. The links helped also. I won’t be rushing out for this version. You could find this forum discussion will give some very helpful detail, including comment from one of the translators. Colossians 2:9, “God’s nature” in the CSB, is a carryover from the HCSB even though it was rightly criticized when it appeared there. Why did they do that? A wide range of solid scholarship supports the meaning of “(the) Deity” here. Recently I could not use a CSB to share with Jehovah’s Witnesses that Colossians 2:9 clearly declares the Deity of the Lord Jesus. Wow. That’s not really a translation of θεότης at all! It’s more of a paraphrase… And I’m not even sure it’s an accurate paraphrase! The Greek is pretty clear here, and it seems as though translating it as “God’s nature” muddies clear waters. Thanks for commenting.